Form fitting socks designed to keep your toes warm when swimming in chilly waters and also help prevent injury to the bottom of your feet when walking or running on rocky surfaces. They come in handy on long transition runs too! Since 1993, we’ve designed, tested, refined and crafted wetsuits and swimskins that transcend the confines of what is possible. In the process, we’ve carried world-class athletes to victory and instilled confidence in beginners. We make products that empower swimmers to achieve their personal bests. We are swimming. We are blueseventy. blueseventy Neoprene Swim Socks is rated 4.6 out of 5 by 204. Rated 5 out of 5 by Sport10 from Great product Really like these swim socks and I have had them a while now. Nice to swim in and good for walking to the start of a swim. Would definitely recommend. Rated 4 out of 5 by f057 from Comfortable and warm I sized down after reading other people's reviews and the small are a good fit for my size 6.5 feet. They've helped to keep my feet warm on some long and cold swims, and also help with protecting my feet a little bit from stones etc when getting into the water. Rated 5 out of 5 by Buddhistswimmer from Didn't realise they were knee high but am so happy Love this long swimming socks. Longer the ones I have used before but am so greatful that they are. Am able to swim really well in them and today was able to stay in the water at 8 degrees for 25 minutes with just the socks and gloves. Great stuff! 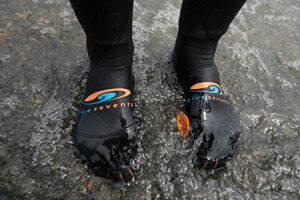 When wearing with a tri wetsuit should they be worn over or under the wetsuit? Are you allowed to wear these socks in an Ironman competition? Swim sock for female, uk shoe size 7, should I buy small or large? Will size small fit my wee size 5 female feet, or will I end up with dragging water filled toes? You should be fine with the Small size, they are form fitting and will still be close fit on a UK 5 foot. Is there a Medium size available? Following the last 2 Q&amp;A's on this product, you've suggested a Small/Medium size. But no medium appears to exist. I'm a 9.5/10 size, so I would imagine a small would be too small and a large too big? Does a Medium size exist and if so are you likely to stock them? Or can you be more clear as to what size range the Small and Large sizes accommodate. Blue seventy only make a small and a large version, these are stretchy socks and are meant to almost be a universal fit. Blue seventy do not provide a sizing chart for this product but reviews suggest anything under a size 9 will be a small and anything over a 9 would be a large. Hi, as a Men's size 13 foot i was wondering what kind of sizing i should be looking at or if there is a similar product what is suited better for me. Unfortunately I can confirm that after an extensive search of our sites' available stock, I have not been able to find a suitable product to recommend to you. Please accept my apologies for any inconvenience caused. There a rubber gripper around the topof the sock which keeps them on most of the time. I sometimes wear them with my fins when playing underwater hockey and just very occasionally they do roll down, but the style of swimming is very different, I imagine doing crawl in a straight line would be fine. Size small was perfect for a slim uk 7 and skinny ankles, so not sure if theyd be great for a 9, might be too tight on the leg. I would recommend the Small/Medium size for best fit. Hi, Sizes are stated as amall and large. I have size 9 feet, so which should I go for? You should be fine with the Small/Medium size. These offer 2mm Yamamoto neoprene maximizes warmth and comfort.